The CNMI is a tax haven and tourist heaven. 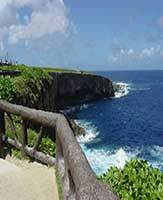 Japanese and Korean tourists enjoy complete visa waivers. Unfortunately visitor arrivals were hit by the Asian crisis and have fallen continuously since then, from 736,000 in 1996, to 435,464 in 2006. The average hotel daily spend crashed to US$80/night in 2004, from US$136/night in 1997. Daily rates somewhat recovered in 2006 to US$90/night. To make matters worse, the January 2005 Multi-Fiber Agreement, which ends textile quotas, has impacted the CNMI, which long enjoyed the almost unique advantage of a low-cost Asian labour force except from US visa and immigration rules, at the same time as it sold its textiles quota-free in the US domestic market. This special advantage has now vanished. Real estate prices in CNMI have fallen by as much as 90% in some areas since 1997. Building permits have slumped from a year high of 597 in 1999, to 292 in 2006, an all-time low. CNMI building prices tend to be volatile as a result of Article 12 of the Constitution, which bars foreigners (Non-Northern Marianas descent) from acquiring real property fee simple. Local law requires property owners to be of at least 25% CNMI descent. Calls for repealing Article 12, or extending the lease term beyond 55 years, have become more insistent as a result of the economic slump. But as Article 12 prevents the Commonwealth from being overwhelmed by tele-commuters and retirees, feelings can run high, and recently proposed amendments of the lease period were defeated in the House of Representatives. Property prices are still falling, leading to higher yields. 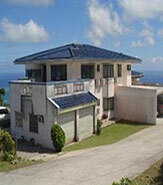 Property prices are around US$500 to US$1,200 per sq. m. A 100-sq. m. house worth US$80,000 can be rented at US$850 per month, providing a rental yield of 12.75%. Bigger properties have higher yields, around 14% to 19.35%. At present there is no multiple listing service for real estate vacancies in CNMI neither is there any other formal mechanism for an industry-wide participation for the industry members and, thus, no industry-wide data on prices on otherwise. Rental Income: Net rental income is taxed at progressive rates. Income-generating expenses are deductible from the gross rent. Capital Gains: Earnings or gains from the sale or lease of personal property within the CNMI are subject to flat rate of 30%. However, if the taxpayer files an income tax return in the islands, he is entitled to 100% rebate on this tax, and can pay capital gains tax at progressive rates. Inheritance: The estate tax in the islands is patterned after the estate tax in the US. Of the 14 islands of the commonwealth, only 5 are inhabited. Saipan, the largest island, accounts for about 90% of the Commonwealth’s population while the next two largest islands, Rota and Tinian, almost equally split the remaining 10% of the population between them. Some of the smaller northern islands are inhabited by a handful of residents. The CNMI used to be a part of the United Nations’ Trust Territory of the Pacific Island (TTPI) that the United States administered after the end of the Second World War. In 1978, the Islands came into being “in political union with and under the sovereignty of the US” and became a US commonwealth. The commonwealth’s new status allowed for different immigration, labor and wage laws relative to those practices in the mainland. Although considered US citizens, CNMI citizens do not vote in federal elections and are exempt from paying federal taxes. Because of different immigration laws, the billion dollar garment industry has long employed thousands of migrant workers from the Philippines, China and other nearby countries. There are more migrants than indigenous Chamarro and Corolinian population in CNMI. The garment industry has been severely impacted by the lifting of import quotas on Chinese-made garments in 2005 as mandated by the World Trade Organization (WTO). The economic woes were exacerbated by the decline of tourist arrivals especially from Japan; about 60% to 75% of the 0.5 million tourists visiting CNMI annually come from Japan. In 2005, Japan Airlines ended flights to the territory. However Korean tourism has been increasing, with Asiana Airlines increasing its flight numbers, and China Eastern Airlines now flied to Saipan four days a week, promising a large flow of Chinese tourists.